Way back in the heady days of October 2012 I purchased a popular wireless router – the ASUS RT-N66U. It was so cool that ASUS even nicknamed it The Dark Night. For nearly three years it was not only the router I wanted, but the one I needed. It more than got the job done. Then we moved into a new house, and the wireless speeds mysteriously became unreliable. Even 30 feet away I couldn’t get a decent test result. My 100M/10M Internet connection was hobbled. I ran tests and quickly found that a wired connection to the router worked perfectly. 2.4ghz was fine, but since the limits of 802.11g meant I couldn’t fully utilize my bandwidth, I opened a ticket with ASUS support. After a week of fruitlessly testing different settings, the 5ghz band’s performance was less reliable than Lindsay Lohan. ASUS initiated an RMA. But wait, isn’t this an article about Google’s OnHub router? I’m getting there, I promise. Despite ASUS’ RMA, I decided to purchase a new router. I didn’t have any confidence that a new RT-N66U would work any better than mine did, and I wanted the speed of 802.11ac rather than the 802.11n that the RT-N66U topped out at. Research pointed me in the direction of Google’s OnHub, the company’s latest foray into something that isn’t a search engine and that, in hindsight, maybe they shouldn’t be doing at all. For the record, I’m talking about the TP-Link version of the OnHub, not the ASUS version which wasn’t out at the time. The reviews said that the OnHub was fast, reliable, and easy to use. The thing has 13 (13!) antennas and automatically picks the best band to transmit on. Management is done via an app and is smooth as butter. Sounds good, right? Maybe for your grandma it would be, but for anyone who needs to do more than play online poker or feed virtual farm animals, the OnHub is fatally flawed. First, the available settings are so limited that you immediatly find yourself working around the OnHub’s limitations. You can’t change the network from the default settings. Want something different than 192.168.86.x? Tough. You can’t setup a DMZ. In fact, the keyword “DMZ” doesn’t even appear on the OnHub support site. There are no VPN settings. You don’t have the ability to adjust the wireless networks; in fact, the OnHub uses the same SSID for both, so you can’t tell them apart unless your client software shows you the network type. There is no guest network option, so anyone who visits can see all of your stuff. Hope you’re not running a home office. DDNS isn’t available, so if you need to remotely manage anything on your network you’ll just have to use your IP or setup DDNS on each machine. I could go on. Don’t worry, I won’t. Suffice it to say that the OnHub’s feature set is minimal at best. I could live with all of that, really, if the thing just worked as advertised. But it doesn’t. Test result while connected directly to modem. The OnHub’s fatal flaw is how it handles wireless connections. Let’s say you have a fancy new 802.11ac adapter on your computer and you want to get that speed, son! Well hold on now, junior. The OnHub will have something to say about that. If it thinks you are better served with 802.11g, that’s what you’re going to get. You don’t have any say in the matter. Your only recourse is to reconnect and hope you get the better network. Even then the OnHub may change its mind and disconnect you and reconnect on a different band, and it does that. A lot. For some users that may not be a problem; maybe they wouldn’t even notice. But I did, every time, and it drove me insane. 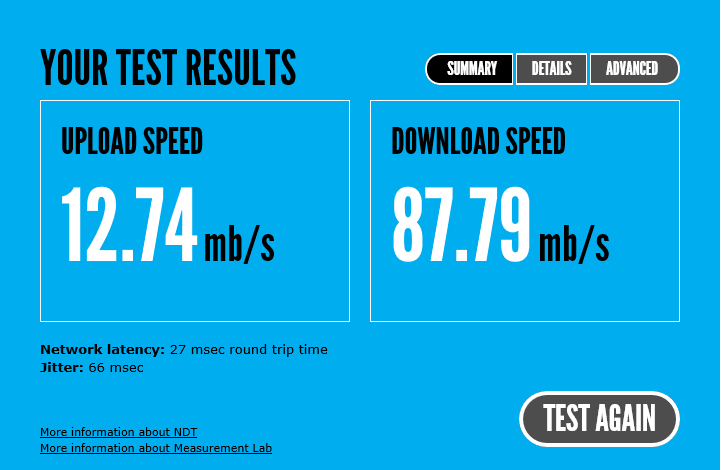 Test result when connected to the OnHub’s LAN port. I could never tell why the OnHub chose to reconnect me, either. The signal was always strong at my location, and what’s the point of having all those antenna and beam forming technology if you can’t project a stable signal? Watching you network connection drop and reset a dozen times a day is frustrating and, in my case, was hurting my business. I knew the ISP wasn’t at fault from my previous tests on the ASUS router and because the OnHub app has a performance test that runs directly from the OnHub to a testing server and showed me getting my full connection speed; only my wireless was suffering. Test result using 802.11ac connection 30ft from OnHub. So I did what you do. I opened a ticket with Google support. But not really, because Google doesn’t have a ticket system. You just Email an address and they get back to you. No auto-replies, no confirmations. It’s just like you’re Emailing your nerdy friend for help, except you can’t check Facebook to see if he’s been online and is just ignoring you. After a week of back and forth it became clear that Google doesn’t have a lot of tools to support OnHub users. Their advice amounted to resetting the OnHub and modem and testing again. 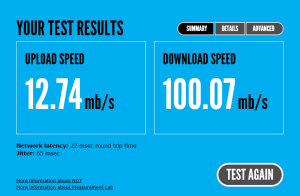 They asked for a series of screenshots of speed tests from different sources including their recommended testing site, M-Lab’s NDT, which I meticulously put together. The results were clear; the connection to my ISP was fine. 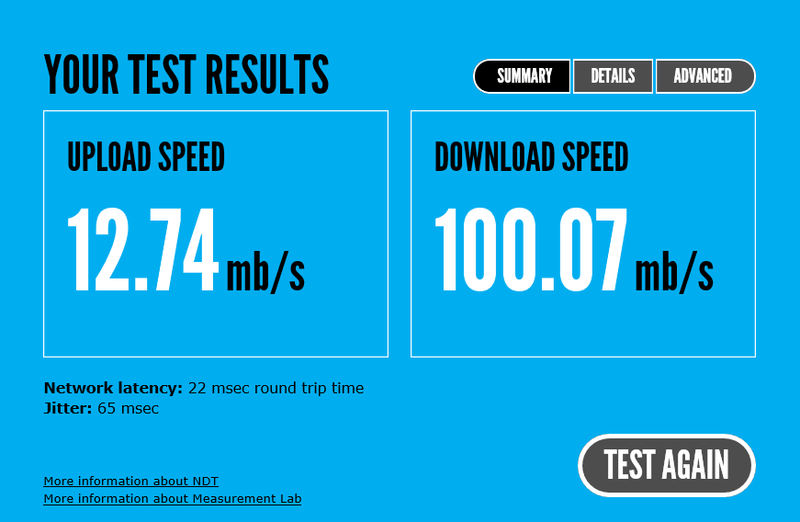 Speeds via the single OnHub LAN port were fine. Wireless connections were unreliable and didn’t deliver, even in the same room a few feet from the router. Our engineer has been looking into your issue. He examined the results of your tests as well as looked into the logs we were able to pull from the OnHub. He does not believe that there is any unusual activity from your OnHub. All the tests seem like they have typical results. The information that you are going to get from the OnHub’s network check is almost always going to be different from using speedtest.net or other online speed tests because of what they are aiming to deliver. 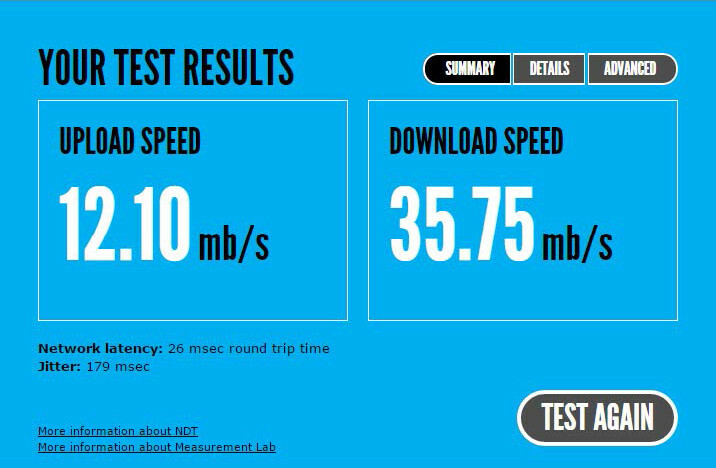 Speedtest.net and other online tests will give you the actual speed that the device is getting, while the OnHub’s network check is going to give you the upload/download speeds that the OnHub is capable of delivering– basically the speeds it is receiving from your ISP. Conclusion: Google is fine with their OnHub router not delivering full speed or reliable wireless connectivity to their customers. This is not “unusual activity” for the OnHub; they are “typical results.” I have submitted a request for a return and refund from Google and ordered a new router. I’m very disappointed not only in the OnHub itself, but in Google’s technical support. Having purchased several hardware products from them in the past, I know they can do better.